Almost as soon as the initial shaking from the Tohoku Earthquake, writers, translators, designers and developers around the world began to think about how to use their own talents to make sense of the immense tragedy, the sudden barrage of evolving information and unfamiliar terminology, and lingering risks. Their efforts have resulted in dozens of different ways that add perspective and context, helping all of us make better decisions as we try to rebuild and support the population in need. Ping us on twitter @aqworks if we’ve missed anything. 1. Map some of the basic data points around the disaster and bring a better understanding of the scale of the event. 2. Provide visual assets to citizen journalists and bloggers to supplement their coverage. 3. Help independent designers around the world build new data visualizations around the disaster to spread understanding and support for the rebuilding phase. If you use, reuse, mix, remix, build upon, share this kit, please send us links to your creations so we can share them on our blog. This Japan Map Kit is licensed under a Creative Commons Attribution-ShareAlike 3.0 Unported License. Developed by Paul Nicholls, the map presents a time-lapse visualisation of the Sendai earthquake and its aftershocks (more than 700 as of publication date). It’s a great tool to visualize the sheer number quakes in the region since March 11. The time-lapse effect is quite dramatic. The graphs and movie show the displacements and surface waves created by the earthquakes. Each dot/arrow represents a continuous high precision GPS station of which more than 1200 are distributed throughout Japan in a network called GEONET. Watch the impact of the earthquake ripple through the length of Japan. Simple chart highlighting the unusually lengthy earthquake as well as its intensity at the surface using the Shindo Japanese scale. This colourful pacific Ocean illustration by the New York Times does a great job of conveying the scale and reach of the tsunamis across the ocean as well as the time it took to reach South American shores. I would have liked an indication of the speed of the waves. Developed for ABC News by Andrew Kesper: this clever mouse over effect on aerial photos taken over Japan reveals the scale of devastation across dozens of towns and tens of thousands of homes and businesses. This dashboard displays earthquake key metrics (number, depth, magnitude, etc.) and relates this data to the Dow Jones and Nikkei stock markets. An interactive map and photographs by the New York Times of places in Japan that were damaged by the earthquake and tsunami. Keeps a tally of damaged buildings, dead or missing people and was last updated on March 22. It does a good job at giving a precise idea of the scale of the devastation and the number of communities that were touched. Well complete and well designed dashboard by DigitalSurgeons that covers the damage caused by the earthquake and tsunami, in terms of magnitude, traveling speed, surface energy, geophysical impact, height, number of cities destroyed, deaths, injured, missing, and economic impact. Puts together a summary of the two agencies (Fire and Police) damage statistics with additional information from other sources. It also includes local prefecture reports. Very precise and regularly updated. offers an interface to view high resolution satellite photos of Japan, taken since the earthquake. You can see that most of the regions touched by the earthquake and tsunami are now covered in snow, slowing down rescue operations and making the conditions of life of the refugees that more precarious. This image from Zeit Online does a great job conveying just how big the disaster area is. As we are often unfamiliar with a disaster area, it is good to give a scale to it by comparing it to things we are move familiar with, in this case a map of Germany. This great dashboard shows current Tokyo power supply by TEPCO (data feed) vs Tokyo’s Power consumption and the status of the rolling blackouts. Stay under 100% Usage and the blackouts are cancelled. Yahoo Japan has released a special version of its national map service to help identify which areas are within the 5 rolling blackout groups. Phillip from fleep.com created an amazing array of Radiation Graphs, made from data from mobile monitoring posts setup by the Prefectural Offices (Local Council / Local Government) in the areas of Tokyo, Chiba, Saitama, Ibaraki, Tochigi, Gunma, Yamagata, Miyagi, Iwate, Fukushima Area, Iwaki and the Fukushima Dai Ichi and Dai Ni Nuclear Plants. Interesting because it provides a different view on the MEXT data that everyone else is graphing. This MEXT chart translated by student of Keio University does a great job of explaining how you are exposed to radiations on a daily basis and helps you add context to the numbers you hear in the news. Perhaps the most popular radiation dose around. Although for general use only, it does a good job of representing various radiation doses in relation to each other. Country-wide monitoring of levels of Iodine 131 and Cesium 137 in water. Impressive but not “Real-Time”. 24hrs delay which is too slow considering the past couple of days of news regarding radioactive levels in water in Tokyo. 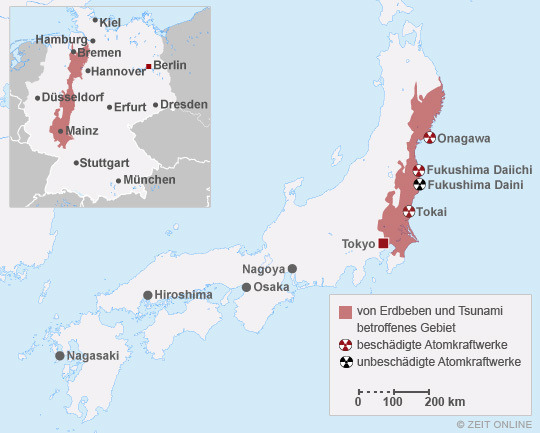 An interesting representation of “radioactive fallout” in the main cities mentioned in relation to the nuclear crisis, as well as comparison data. Like snow on a black background, the animation makes for a pretty striking and simple to understand representation of the radiation we absorb every hour. The map pulls data from Ushahidi, Twitter, Flickr, YouTube and overlays them onto a map of Japan. Lacking content. A Japanese version of Google’s Crisis Response map which details location of shelters, powerplants, earthquakes and satellite photos of the stricken areas. This mashup is born out of the collaboration of Honda and Toyota’s Navigation systems, tracking their drivers’ movements on the roads in the affected areas. The blue lines represents the roads drivers were able to take. The grey or yellow ones, possibly damaged ones.